When the newspapers of the day refused to publish prices from the new international bond market growing up at the end of the 1960s, Euromoney was founded to report on the business. Innovators drove the markets – what drives them now? Capital markets bankers have spent much of the last five decades dreaming up products to help clients and themselves make money, but is process, which has largely taken a back seat, now becoming the battleground? The LDC crisis, Black Monday, LTCM, the GFC – the past 50 years in global finance have been defined by disasters rather than successes. Derivatives: From innovation to exploitation… and back again? Market veterans discuss how innovation in derivatives helped to open debt markets, hedge risk and tailor investments, before threatening the stability of the system during the global financial crisis of 2008. 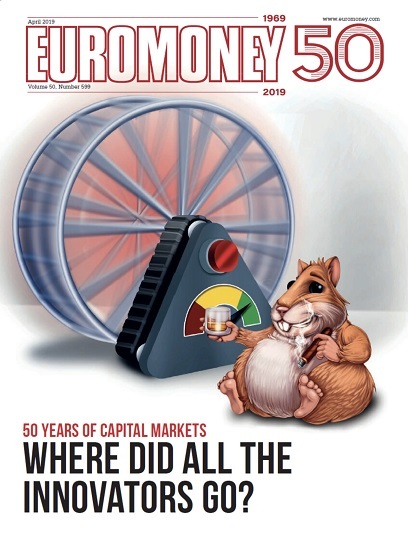 As part of Euromoney's 50th anniversary coverage, we profile some of the biggest names that we interviewed for our April capital markets focus. Expectations of the valuation investors are likely to put on Uber when it lists are falling in line with the shares of its closest competitor that beat it to public ownership. Investors and issuers increasingly view leveraged loans and high yield bonds as practically one and the same from a risk perspective. After so long, private bank clients and even retail investors are no longer happy with the returns from government bonds; instead, they are searching for yield and pushing up the value of risk assets. Can Cabannes save SocGen's investment bank? Disastrous fourth-quarter results cast a long shadow over Société Générale’s business, especially its corporate and investment bank. Pakistan is a bailout addict, having spent 22 of the last 30 years in the fund’s intensive care, but can Imran Khan’s new government break that dependency? His finance minister says he has the cure. The Euromoney Belt and Road Index (EBRI) combines International Monetary Fund (IMF) GDP figures with investment climate (IC) scores sourced from economists and political experts who ranked countries on the Euromoney Country Risk platform. Protectionism is undermining an otherwise moderate global outlook as growth continues, labour markets tighten and geopolitical crises calm.